The most meaningful day of my priestly career began with a call from a former student. Her grandmother had been lying in bed at the final stage of her life while the family waited for the end to arrive. After two weeks of waiting, her aunts began to wonder why their mother was holding on to life with such tenacity. My former student guessed that her grandmother, a believing Catholic, was waiting for a priest’s visit before beginning her passage into eternity. Arriving at the house, I was led into the grandmother’s room. By this time, she was incapable of talking or responding. I informed the people in the room that the dying often know what is happening even past the time they can communicate, so they should speak what needed to be said. I then offered some of the prayers of the church, including the final commendation. The ceremony is simple yet profound. Once it was over, I spoke some parting words and showed myself to the door. On the way out, my former student remarked that while we were praying, her grandmother’s hands, once icy cold, had become burning hot. She knew what was happening. I returned to my car knowing that I had to hurry back home. I had a baptism scheduled for that afternoon. It was the first child of a couple who had met as Fellowship of Catholic University Students missionaries and were now beginning their family. I’ve come to find that it is difficult to mess up a baptism. You have a baby, happy relatives, water and the Trinitarian formula. If a priest messes that up, it’s his own fault. It helped knowing that for this particular family, this christening was not simply a generic rite of passage, but a dying and rising with Christ that began in this world and reached out into the next. The baby girl was baptized and entered into the life of grace. Upon departing from the chapel, I glanced at my phone and noticed a voicemail I had missed while setting up for the baptism. It was from my former student. She had called to inform me that within a half hour of my departure from their house, her grandmother had passed away surrounded by her family. It was the kind of ending one only expects in a book, but honestly, I was not surprised. This is the way God works. — The lives of all people, young and old. — The new life of the baptized and forgiven, or the new life of the married couple. — The sting of death, somewhat blunted in those who have led a full life, but throbbing with raw force in the death of a young child. — The spiritual death of sin from which the priest is constantly calling all people — including himself — with the words that God gives him. There are days when a priest’s life seems a swarm of activity, where he struggles to keep track of the disparate events, projects, problems and opportunities that come his way. As a young man, the priest worries that he is not up to the task. As a somewhat older man, he knows that this is so. The stakes often seem enormously high, but such is the result of living in a world where things matter. I, for one, would not want to live in any other world. But I know that I am not alone in this ministry. It is not my ministry to begin with. It is the ministry of Jesus that he entrusted to the church. On that day that began with a peaceful death and ended with a joyful birth, I experienced that ministry alive and active whereby Jesus continues to make himself present to the people who have eyes to see him. 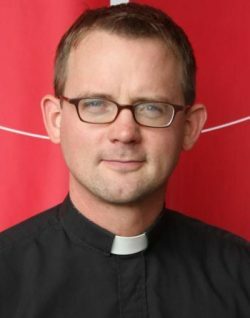 Jesuit Father Dyer is the chaplain of Jesuit High School in New Orleans.